Word has been received of the death of Harold Snively, former caretaker at Camp Clear Lake, the Grace Brethren camp in Naches, Wash., and the twin brother of the late Grace Brethren pastor Howard Snively. His obituary appears below. 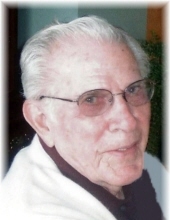 Harold Snively, age 90, of Sun Lake, Ariz., formerly of New Market, Iowa, area entered into peace Saturday, May 19 at Hospice of the Valley, Friendship Village, Tempe, Ariz. Funeral services were held 2 p.m. Wednesday, May 31, at Ritchie Funeral Home, Clarinda, Iowa. Burial was in Memory Cemetery, New Market. He was born in Braddyville on October 28, 1926. He was the eighth child of Ren and Florence Maxwell Snively and the second born of a set of identical twins. The family moved to New Market just before he and his twin brother Howard started to school in the first grade. He lettered in baseball, basketball, and track. The brothers graduated from high school in May of 1944. They both enlisted in the Navy. After boot camp, Harold studied and passed oral and written exams and was promoted to Seaman 1st class and then to Gunners Mate 3rd Class. He also did a little boxing. Because of these activities, he was assigned to Shore Patrol Duty in Reno, Nev., on a rotational basis. After being honorably discharged from the Navy, Harold enrolled in the Iowa Barber College in Des Moines. After graduating and passing state board exams he worked for a short time in Bedford, Iowa, and then for Art Stewart in Clarinda. He moved to Rawlins, Wy., in July of 1949 and worked as a barber. He married Mary Evelyn Morris in August of 1949 in Rawlins, Wy. To this union were born two daughters; Patricia Kay and Bonnie Sue. Harold was always extremely proud of these daughters. They were both National Honor Society students, cheerleaders, and foreign exchange students. They were both on the swimming, track and tennis teams. Pat met Arch Coderre while attending Washington State University in the Honors Program. Arch was from Medicine Hat, Alberta. They now live in Red Deer, Alberta. They have two children, Kirby and Karrie. Kirby married Lynne Gilbert and they have two boys, Reed and Luc and live in Alberta, Canada. Karrie married Joel Jones and they have two children, Danika and Hunter and live in Alberta, Canada. Bonnie married classmate Ron Hirst of Coulee Dam, Wash., and they have two girls, Lacey and Trilby and live in Washington. Lacey has two children, Blaine and Meri, who live in Washington. Trilby married Richard Michels and they have two children, Rylee and Mia, and live in Washington. Harold was hired by the Rawlins Police Department in 1951, because of his experience as Shore Patrol in the Navy. He enjoyed this work very much. He learned to classify fingerprints, and take and file mug shots. He replaced the Chief and Lieutenant when they were off duty. However, when he received an offer in 1953 for employment to work for the U.S. Bureau of Reclamation at Seminoe Dam in the operation of hydroelectric generators and high voltage transmission lines, he jumped at the opportunity. This was his choice for a career. He transferred from Seminoe to Palisades Dam in Idaho. He took college courses via night school and extension classes and was promoted to the supervisory and management ranks. From Palisades, he transferred to Flaming Gorge Dam in Utah, then to Grand Coulee Dam in Washington; to the Yakima Valley Project and then to The Central Valley Project Office in Sacramento, Calif. He retired on Jan. 9, 1981. Harold experienced an epiphany on March 24, 1973. On occasion, he would witness to others and tell them that he had accepted Jesus Christ as savior and God changed his life. He was ever thankful for his salvation. He and Evelyn became full-time RVer’s for about eight years. They were in every state of these United States and most of the Provinces of Canada, eventually buying a place in Florence, Ariz.
About the time Harold retired, Evelyn was treated for breast cancer with radical mastectomy and chemo treatments. She passed away in August of 1995 because the cancer had metastasized to her lungs. Harold then moved to Sun Lakes, Ariz., and was alone until April of 2005 when he married Peggy McBride. They were happily married until his death. Harold was an avid sportsman and loved to golf. He played to a low handicap and had three holes-in-one. He was also a pitcher on several fast-pitch softball teams. Making a sky dive was on his Bucket List. On Jan. 15, 2012, at the age of 85, he was able to scratch it off the list by making a tandem sky dive from 13,000 feet. He reported that the jump and the free fall was where the thrill was. During the free fall, the falling speed was approximately 124 mph. He was pre-deceased by wife Mary Evelyn, his parents Ren Snively and Florence Maxwell Snively of New Market; sisters Mae (Ed) Anderson, Braddyville, Marjorie (Virgil) Bangs of Faragut, Esther (Vernon) Hamilton of Clarinda, brothers Eldon New Market, Oral (Myra) of Portland, Oregon, Earl (Garnette) of Council Bluffs and twin brother Howard (Evelyn Marie) Warsaw, Indiana and some nieces and nephews Harold Snively & Harold Duke. He is survived by his wife Peggy McBride of the home; daughter Patricia (Arch) Coderre of Red Deer, Alberta, Canada, son Kirby (Lynne), Reed and Luc, of Alberta, Canada: daughter Karrie (Joel) Jones, Danika and Hunter of Alberta, Canada; daughter Bonnie (Ronald) Hirst, daughter Lacey Hirst, Blaine and Meri; daughter Trilby (Richard) Michels. Rylee and Mia all of Tonasket, Wash.
Twin brother Howard’s family; son Daniel (Joan) Indianapolis, Ind., and Michael (Beth); daughters Dianne Lund (Joe) and Janice Strang (Ed) and their families, all of Warsaw, Indiana. Sisters-in-law Madeline Forbes, Saratoga, Wy. ; and Verla Sabin, Sinclair, Wy. and families. His wife Peggy’s children: Melinda (James), Elizabeth and Jamie; son Michael (Kim), Sean and Brendon.